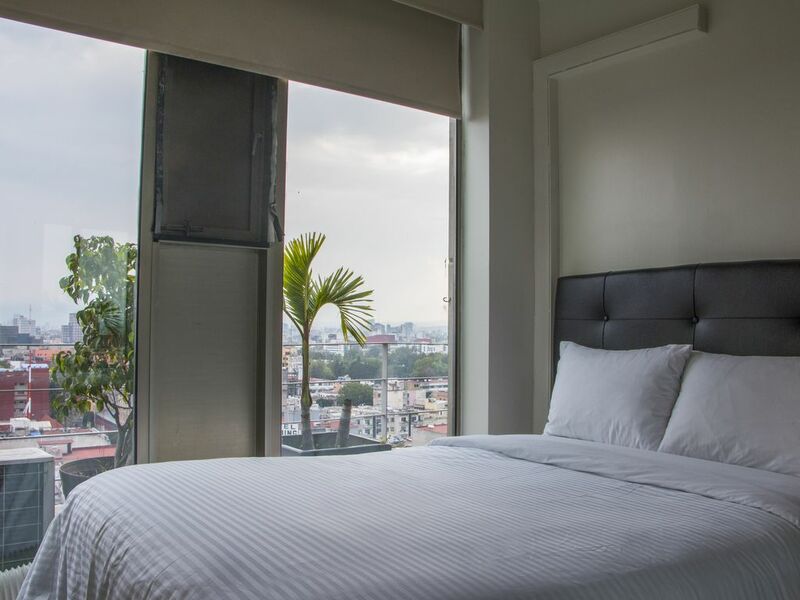 Make the most of your stay by taking advantage of our unmatched personalized service while enjoying all the comforts of home and more in this 2 Bedrooms / 2 Bathrooms condo in the heart of Mexico City. The owner is a bilingual US expat who has resided in the city for nine years and is on call 24 hours a day to make your stay very special. The apartment is located in the award winning condominium community Puerta Alameda. The complex has door men and security 24/7 along with amenities such as an indoor heated pool and a gymnasium, business center available for guests, a children’s jungle gym play area and more. The condo is within walking distance, visitors will find the Paseo de la Reforma, Parque Alameda and the Palacio de Bellas Artes, the Zocalo, the Ciudadela Crafts Market, and several major museums and attractions.There are three subway lines which are about a stone’s throw away. The complex is only a 15 minute taxi ride to the Castillo de Chapultepec, the NATIONAL MUSEUM OF ANTHROPOLOGY and few other museums in Parque Chapultepec. Our personalized service starts the moment that you arrive with airport pickup offer for a reasonable fee. Once you checked in at the condo, you will be offered our guest a tour of the condo complex facilities along with pointing out restaurants and grocery stores, pharmacies and such. Flexible check-in/checkout hours are offered whenever possible. A private car service with our highly recommend bilingual driver is available upon request at very reasonable rates. The unit is furnished with pillowtop mattresses, high thread-count sheets, quality towels, drinking water, refrigerator, stove, microwave, dishwasher, coffee maker, DVD television, and air conditioning. The unit also has a full-size washer and full-size dryer. High-speed WiFi INTERNET is provided in the apartment. The unit also has air conditioning. The apartment has a 30-foot long balcony with 180-degree views of sites east, south and west of the city. CLIMATE CONTROL – The apartment has Low-E floor to ceiling windows which work to keep the apartment cool during the day. There is an air conditioner unit in the master bedroom which keeps the apartment cool on the hottest day. The weather in Mexico is generally mild. However, during the rainy season (May-August), the city can become humid (muggy). Because of the relatively mild climate and the high cost of electricity, it is extremely rare to find a vacation rental unit with climate control. Our goal is to provide our guest´s with unsurpassed personalized attention from the minute they arrive in Mexico until their check out doing all we can to assure that their stay has been a most memorable one. I am a bilingual US expat who has resided in the city for ten years. I studied Spanish in Barcelona and have visited over 20 countries traveling over a million miles in the last twenty years. I know how to place myself in the visiting guest’s shoes and I work hard to provide unsurpassed personalized that will make their visit to Mexico City all the more memorable. The apartment is located in the award winning condominium community Puerta Alameda which provides excellent security staring with access to the building being limited to residents with magnetic security cards to the enter the building (Magnetic security cards provide to our guests during their stay) . Once entering the building there are doormen and security is provided 24/7. Luxury amenities for the complex include a heated lap size pools, a full size gym, a rooftop jogging track and sunning areas as well very tranquil patio / garden areas throughout the complex. Also there are confortable lobby areas with sofas and chair to relax and Wi-Fi access is available. I have the delightful experience of being of service to more than 100 guests in the last 8 years. Our personalized service starts the moment you arrive with airport pickup. We also offer our guest a tour of the condo complex facilities along with pointing out restaurants and grocery stores, pharmacies and such. Flexible check in and check out hours are offered whenever possible. The condo is within walking distance, visitors will find the Paseo de la Reforma, Parque Alameda and the Palacio de Bellas Artes, the Zocalo, the Ciudadela Crafts Market and several major museums and attractions. Two subway lines and the Mexico City Turibus line are a stone’s throw away. A private car service with our highly recommend bilingual driver is available upon request at very reasonable rates. Historic Center walking distance to Bellas Artes, Zocalo, Templo Mayor, Paseo de Reforma and my other points of interest. Split Unit AC in the living room. Portable AC in the master bedroom. The apartment has Low-E windows. Easy access individual parking space inside parking garage of the condominium complex. Private Balcon 25 ft long with table and two chairs. Individual Inflatable Air mattress can be provided for children upon request for a nominal fee of $10 per night. The mattress inflates and deflates in less than one minute and can be used in the living room. Superb apartment with a great view and unbeatable location. The service and attention to detail and to all our needs was truly remarkable. Thank you to the whole team, and look forward to being back!